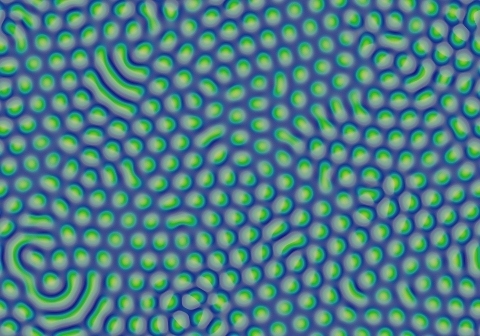 These images and movie demonstrate the behavior of the Gray-Scott reaction-diffusion system with σ=Du/Dv=2 and parameters F=0.0420, k=0.0590. Rings grow, remaining circular with new, non-growing concentric loops forming inside; these then merge to form a field of negative solitons and short worms after 2500 to 3500 tu. The negative solitons slowly replace most of the worms, which survive only along grain boundaries as a transitional state between single and double soliton. Stability sometimes takes over 500,000 tu.